Enjoy beautiful Carmel and all the Monterey area without the high price ticket! 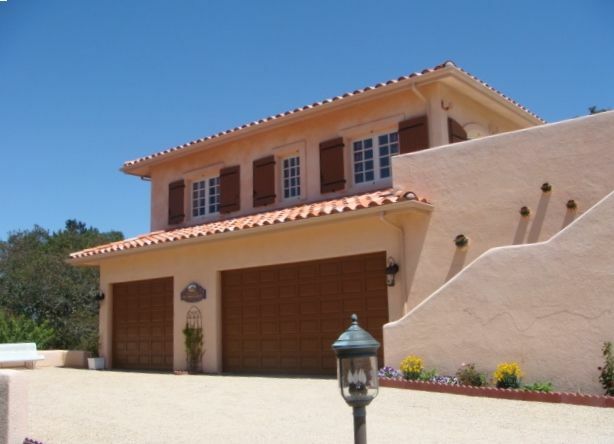 'Maisonette de Provence“ is a separate house with 2 bedrooms -each with a king size bed, on our property overlooking Monterey Bay. Our location will provide you with quick access to all of our charming towns - Carmel, Pebble Beach, Pacific Grove, and Monterey as well as the beach areas, all less than a 15 minute drive away. The views are second to none; enjoy one of the many excellent local wines while taking in the sweeping view of the Monterey bay and city lights from the patio. Our sun-filled landscaped patio and garden area will enhance your visit to the California coast. We are originally from France and our 'Maisonette de Provence' and gardens reflect our origins, the house is decorated in typical Provencial style, we are away from the hustle and bustle, in the quiet and calm of the wooded hills above the coast, yet so close as to be near everything that you will want to visit here. Our hillside is well above the areas which get the costal fog in the summer, and enjoys a very pleasant climate year around, not hot in the summer, not cold in the winter; this is a year-round holiday area. On some days you will see a sea of white below you floating in and out of the valleys, a spectacular sight! The bright, airy, comfortable living room is complete with a genuine leather sofa and love seat, entertainment center featuring a large 46” flat screen HDTV with Satellite TV, DVD, and VCR. We provide free wireless wi-fi throughout the house. The French double doors open directly onto a spacious terrace, the groomed lawn and flower garden. Our Maisonette provides you with the comforts of a stylish hotel and home rolled into one! The upstairs master bedroom features a Cherry wood California King Size bed, a 32' LCD TV with breathtaking view of the Monterey Bay and sparkling city light at night. An antique French armoire completes the ensemble. The charming second bedroom has a King Size bed and a 26' LCD TV in a Provincial atmosphere. The French double doors open to a rose garden. Both bedrooms have an alarm clock with i-pod docking. Connecting the two bedrooms is a small open terrace with views of the Santa Cruz Mountains. The bathroom features an oversized tub with a sink and a toilet. Downstairs you will find the 2 cars garage, kitchen and laundry room. For the gourmet cook there is a fully equipped kitchen with a gas oven, gas cook top, microwave, dishwasher, coffee maker, granite counter top and a flat screen television. The grilling enthusiast will enjoy the gas barbecue. There is a laundry room with washer, dryer, iron and ironing board. If you prefer the more natural way of drying your clothes you can use the outside clothes line. Also for your convenience we provide you with extra pillows, blankets, linen, hair dryer. We live on the property and we will greet you personally upon arrival. The Monterey sports Center is less than a 15 minute drive if you wish to stay in shape during an extended visit. Also, this area is excellent for cycling and hiking; many of our local roads have bicycle and hiking paths. Every season has something to offer here on the Monterey Peninsula; weather is enjoyable all year long and is most spectacular in the spring and fall months. Enjoy the costal lifestyle as we do...for 3 days, or three months! Home was comfortable and loved the patio and views. The only issue was that the only bathroom is in the master bath so it was awkward going thru the patio and into a bedroom to use the bathroom. We were family so we managed. Home was clean and very comfortable. Also... No shower... Think Europe... Hand held faucet. No big deal. This property is wonderful - it was absolutely spotless and had everything we needed. I really appreciated the fact that the owner contacted me prior to accepting our request to be sure that certain aspects of the setup would work for us (i.e. the only bathroom is in the master bedroom). Great communication, great location, and spectacular views!! First, Phillippe was wonderful to deal with, very communicative, and flexible when we arrived hours later than planned. The home is a large guest house above the garage on a very large property, situated atop a hill in a gated neighborhood. A steep, windy road leads you off the 68 Salinas Highway up to the neighborhood. The home is very tidy and nicely decorated, and our party of 4 found it quite comfortable. The upstairs features a large living room with french doors opening to a wonderful patio. Sit in a comfy lounge chair and enjoy an incredible view of the valley, and Monterey and the Bay beyond. It is the home greatest feature. Business took us to Laguna Seca (hardly a half mile down the road) and we could faintly hear the classic sports cars starting up in the distance as we enjoyed a morning cup of coffee on the patio. Fun and memorable. The master bedroom is off the lounge, and the bed was comfortable. The only bathroom is accessible through the master bedroom. It does not have a conventional stand-up shower, but an oversize tub with a pull-out shower head. Different, but it didn't bother anyone in our group. The second bedroom is also accessible through the master bedroom. The kitchen is located downstairs off the garage and is basic but was more than adequate for preparing breakfast and light meals. This property was everything we hoped it would be, was reasonably priced, and Philippe made it easy. I strongly recommend it. Thank you for your your very nice review, I am glad you enjoyed your stay at our cottage. Many necessary changes need to be made to the property. Thank you so much for the review. I do warn people of the odd layout of the bedroom/bathroom before they can book the cottage. You mentioned the curtains do not block the light in the morning, they are just for decoration, the shutters are what keeps the bedroom dark. Also thank you for letting me know about the DVD player not working, I will get it fixed immediately. My husband and I loved our stay! The cottage was perfect and absolutely met our needs. It was charming, the views were more beautiful than the photos. It was invigorating to open the doors and huge windows to the outdoors and enjoy the nice weather. The cottage was more spacious than I had imagined it. It had everything you might possibly need. After 2 nights we ran out of paper goods which we purchased ourselves, no problem. There are a few quirky things about the place which if we were with another couple might have been a little awkward. One, there is one bathroom for the entire place and it is accessed from the master bedroom. Two, to get to the second bedroom you go from the master onto an outdoor, covered veranda and into the bedroom. Despite that, there was a nice sized, well-equipped kitchen, full size washer & dryer, refrigerator, microwave, stove/oven, 3 car garage, outdoor patios, etc. This place definitely exudes French charm and the fresh flowers upon arrival were a welcome touch. We will definitely stay here again! Thank you! I am so glad you enjoyed your stay, thank you so much for the great review. Looking forward to having you again.